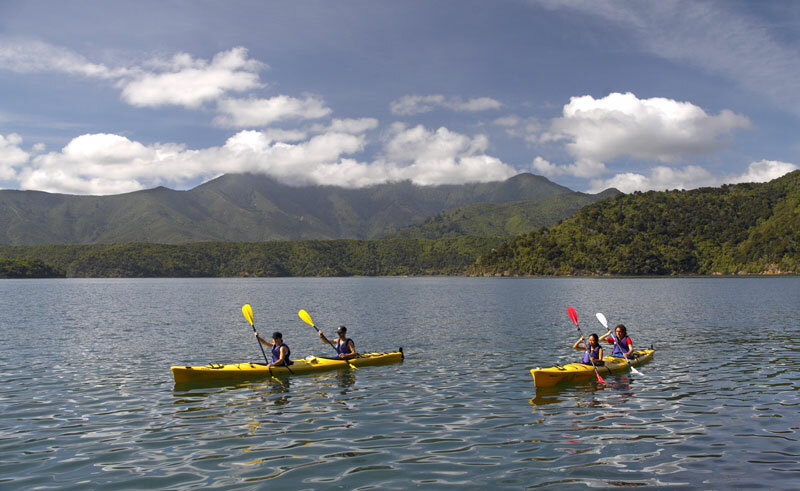 The Queen Charlotte Track is a 70 km route winding through the magical landscapes of the Marlborough Sounds, on the north-eastern tip of South Island. Renowned for stunning coastal views, historical landmarks and variety of native bush and wildlife, there is a choice of four or five day guided walks. Both options include a trip to Motuara Island and dolphin watching opportunities. 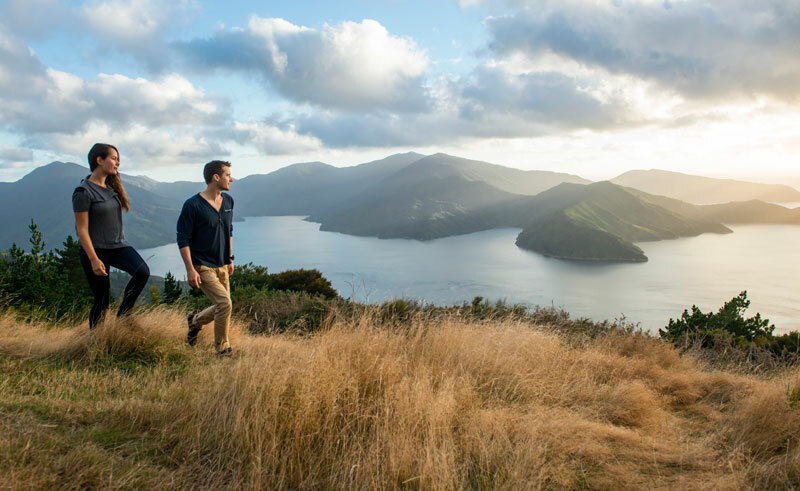 The myriad inlets and islands of the Marlborough Sounds make up an incredible one fifth of New Zealand’s coastline. The convoluted maze of waterways consists of three sounds, the Queen Charlotte, Keneperu and Pelorus Sounds. 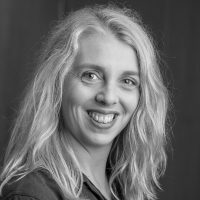 The area takes in pristine native forests of 800 years old rimu trees, lush ponga tree ferns and native orchids, which drape the hills and cliffs that drop down to a rocky shore. These undisturbed forests are home to rare birds like the saddleback and South Island robin. 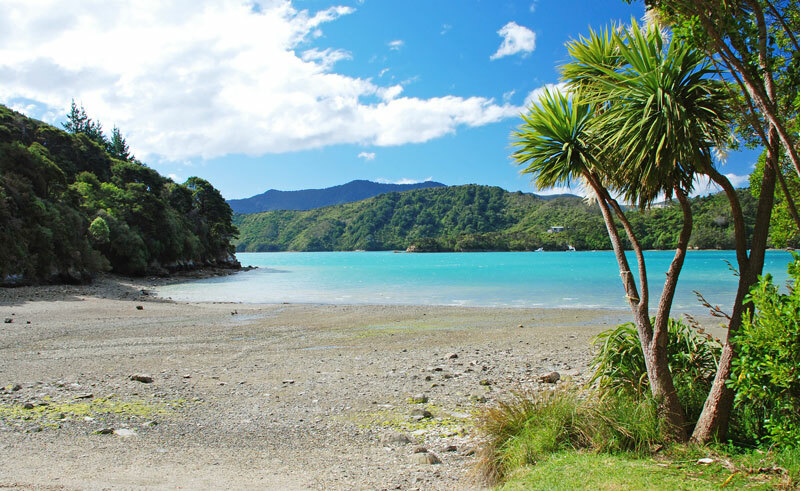 The four and five day trips include transportation to the start and from the end of the trail, from Picton, which is easily accessed from other parts of New Zealand, by coach and ferry. Breakfast, a packed lunch and a three course evening meal are provided each day during the trek. Your luggage is transported between overnight stops by boat, so all you need carry is a day rucksack, with your packed lunch, water bottle, camera and any other items you may need during the day. After booking, we will send you a suggested list of clothing and kit to take. Start your trip with a personalised eco-tour with your guides on board a Cougar Line catamaran. 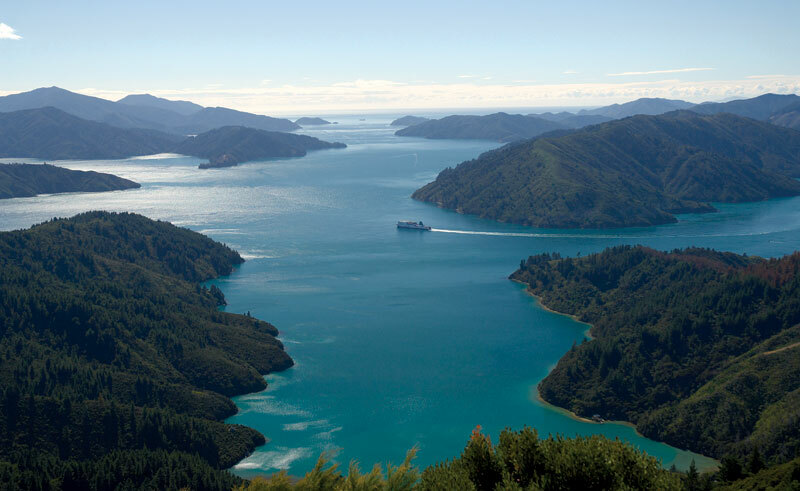 During the morning your guide will share their knowledge of the sea birds and marine mammals as you travel to Motuara Island in the outer-Queen Charlotte Sound. Here you may have the opportunity to see the rare South Island Saddleback and South Island Robin which have been re-colonised on this island sanctuary. From Motuara Island we cross the Sound for drop off at Ship Cove, for the start of your walk. Ship Cove is one of the most historic areas in the Sounds as it was one of James Cook's most popular destinations on his many world travels. The area is surrounded by beautiful virgin bush and the walk to the top of the ridge provides spectacular views before the descent to Endeavour Inlet. Approx 5-6 hours walk / 14 km walking distance. After a leisurely breakfast, walk up to the waterfall, which is surrounded by luxuriant forest. Then re-join the main track as it winds around Endeavour Inlet through forests that are alive with birdsong. Approx 4 hours walk / 12.5 km walking distance. Leaving Punga Cove, climb to the ridge, which divides Queen Charlotte and Keneperu Sounds. Enjoy spectacular views throughout the day walking along an undulating ridge, which is the most challenging section of the trek and you will need to have a good level of fitness to enjoy this walk. For those who prefer, you can opt for a water taxi today instead. Stay overnight at Portage Resort Hotel. Approx 8 hours walk / 24.5 km walking distance. Climb to the ridgeline track for yet more wonderful views. After Mistletoe Bay, the track contours along the hill to drop down into Davies Bay. The last 30 minutes of the walk are through mature beech forest to the end of the trek at Anakiwa, where transport will be waiting to take you back to Picton. Arriving in Picton around 4.30pm you can enjoy a farewell get together at our base with a relaxing drink and reminisce over the magic of the last four days. Approx 7 hours walk / 20 km walking distance.